Graeme Dott defeated Peter Ebdon 18-14 in a monumental contest to win the World Championship at The Crucible. Dott went into the last session leading 15-7 but Ebdon won six successive frames to reduce the deficit to two. Runs of 66 and 68 took Dott to within one frame of victory and, although Ebdon had chances to win frame 32, it was Dott who fell over the line first. It was the longest final in Crucible history, surpassing even the Dennis Taylor-Steve Davis classic in 1985. After the match Dott, who lost the 2004 final to Ronnie O'Sullivan, admitted he thought his title chance was crumbling in the face of Ebdon's thrilling fightback. "I thought it was slipping away from me," he said. "Before that frame I went and washed my face. I really thought my chance had absolutely gone. "After that I decided to quicken up the pace and felt really comfortable." 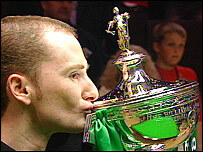 Meanwhile, Ebdon, champion in 2002 and a beaten finalist in 1996, paid generous tribute to his conqueror. "Graeme is tough, dogged and resilient and everything you would expect a world champion to be," said the Dubai-based Englishman. "He outplayed me for three sessions and some of his safety play was brilliant. He thoroughly deserves his victory." Scotland's Dott, who has never won a tournament before, resumed 11-5 ahead on Monday and took the opening frame with a 56 clearance. Ebdon looked relaxed as he took the next with a 78 clearance, his second-highest break of the final to that point. But normal service resumed in the next with both players spurning opportunities to take the frame and Ebdon just nicking it with a run of 28. Frame 20 must have rocked Ebdon, who had a number of chances to win it after Dott broke down on 62 but was unable to hold his nerve. Dott took the next with a 65 clearance after Ebdon missed a black into the middle pocket and the Scot took another scrappy frame, the last of the session, to establish an eight-frame lead. But Ebdon came storming back after the restart, knocking in a 117 break, the highest of the final, to make it 15-9. He proceeded to win the next three frames to make it 15-11 at the mid-session interval. Both players climbed into the trenches for frame 27, which turned out to be the longest in World Championship history at 74 minutes. Dott moved into a lead of 40 before a tense - and lengthy - safety exchange, punctuated by missed long potts, ensued. Dott and Ebdon took turns missing the green before Ebdon mustered the composure to mop up and make it 15-12. Ebdon then went from marathon man to sprinter, rattling up a run of 84, before Dott claimed his first frame of the evening courtesy of a 66 break. Ebdon won the next frame to make it 16-14 before Dott inflicted a huge psychological blow by taking the next. Ebdon had made a 51 break before running out of position and Dott, digging deep into his reserves, replied with a run of 69 to move to within one frame of victory. On taking the frame, Dott let out a primeval roar, but Ebdon looked far from rattled at the start of frame 32. However, looking well set, Ebdon missed a pink into the left-centre pocket and Dott was back in it. Ebdon had other chances, but a missed red into the corner pocket opened the door for Dott, who held his nerve and cleared up - even finding time to kiss the trophy along the way.